Mr. Maze is a first-person fantasy adventure game developed by MJ Lovegrove. When his daughter is captured by the formidable Maze Meister, a fast-thinking father finds himself on an unexpected journey through many maddening mazes to save her. 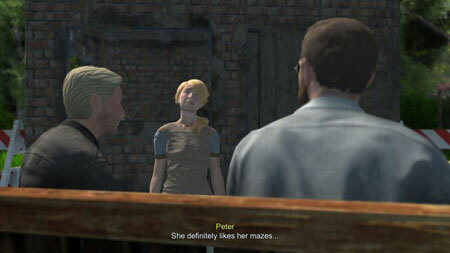 Penny Porter loves mazes. But the fun and thrill of solving them at a local attraction is soon cut short when the mysterious Maze Meister appears and captures her into a strange land. Without hesitation, her father Peter steps into the mysterious realm and must solve a number of mazes and challenges in order to rescue her. The game features more than 10 mazes of varying difficulty to beat, and lots of characters to meet. Experience a light-hearted single-player fantasy short story by MJ Lovegrove. Uncover achievements, additional puzzles and secrets. If you get stuck in the game, check out the video walkthrough and gameplay for the game. This entry was posted in PC Games, Walkthrough and tagged Mr. Maze Cheats, Mr. Maze Gameplay, Mr. Maze Guide, Mr. Maze Solutions, Mr. Maze Strategy, Mr. Maze Tips, Mr. Maze Walkthrough by Marvin. Bookmark the permalink.